St Peter's Church, Ash is the parish church of Ash, the most westerly of the parishes of the Borough of Guildford, maintaining the northwest boundary of Surrey from Hampshire. As with most ancient churches, St Peter's was restored by the Victorians and greatly extended in 1864, since the earlier flint church with its Norman south facing door became far too small for an ever increasing congregation. 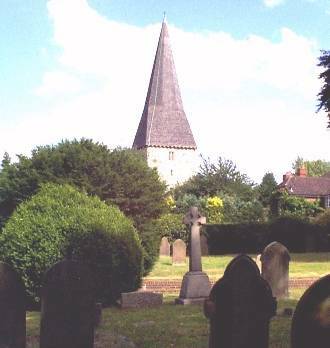 "The Church of Ash" is named in the Domesday Book but is closely associated with the name of Henley. In later years the parish was seemingly known as "Ash by Henley", suggesting that the Manor of Henley was the more important manor. The magnificent eye catching spire and tower, built of Heath stone in the XV Century now supports six bells. The church and its history is splendidly described in the Guide to St Peter's Church Ash, published in 1981 and in which it states "Under Edward III some supplementary provision was made for the parson of Ash, after the inclosure of Henley Park in 1357, on condition of his celebrating divine service daily within the King's manor Henley". 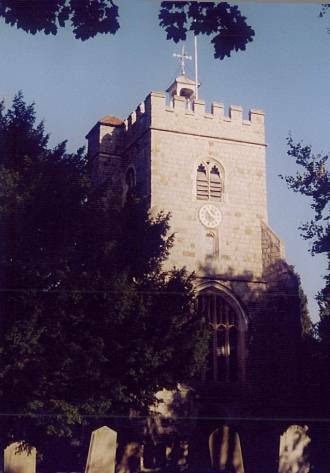 St Mary's Church (mentioned in the Domesday Book), is the parish church of Worplesdon, dedicated to St Mary the Virgin. It stands on probably the highest point of the Perry Hill settlement. The oldest part of the church is the Chantry Chapel: built crudely of field flints during the 11th Century. It has nonetheless staunchly stood the test of the centuries. Surmounting the strong, squat tower, built of heath stone in the mid 15th Century, is "The Turret". This houses the bells and the Church Clock, the latter having been given to the church by the Baxendale family in 1874 when residing at Worplesdon Place, now a Beefeater Hotel. The brick built Admiralty Semaphore tower stood to one side of the tower and not on the top of it as was popularly believed. It was, however, higher than the tower and until demolished in 1847, passed messages from London to Portsmouth to a semaphore on the Hogs Back. In about 1866 the Victorians were determined to beautify the ancient church, with the inevitable loss to the community of hitherto and lovingly appreciated adornments such as the Norman, black, marble font that was replaced with one gifted by Eton College. Many worshipers of the day thought the ancient font was taken for use as an animal drinking trough at a neighbourhood farm.